Use Excel's Get & Transform (Power Query) experience to connect to Microsoft Azure just like any other data source. Microsoft Azure Table storage is a service for storing large sets of structured, non-relational data. For more information about Microsoft Azure Table Storage service, see How to use the Table Storage Service. On the Data tab, click Get Data > From Azure > From Azure Table Storage. 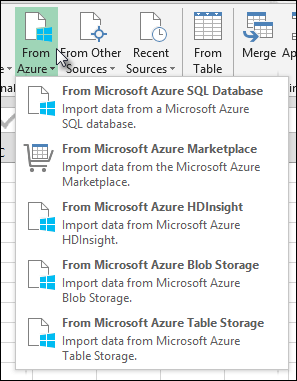 If you don't see the Get Data button, click New Query > From Azure > From Microsoft Azure Table Storage. In the Power Query ribbon tab, click From Azure > From Microsoft Azure Table Storage. Follow the additional steps below. In the Microsoft Microsoft Azure Table Storage dialog box, enter your Microsoft Azure storage account name or URL, and then click OK. If you are connecting to the Table storage service for the first time, you will be prompted to enter and save the storage access key. In the Access Microsoft Azure Table Storage dialog box, enter your storage access key in the Account Key box, and click Save. Note: If you need to retrieve your storage access key, browse to the Microsoft Azure Portal, select your storage account, and then click on the Manage Access Key icon on the bottom of the page. Click on the copy icon to the right of the primary key, and then paste the value in the Account Key box. The Query Editor lists all the available tables in your Microsoft Azure Table Storage in the Navigator. Click a table in the Navigator from where you want to import data. You will see the predefined columns for the selected Microsoft Azure table: PartitionKey, RowKey, Timestamp, and Content. Expand the Content column, and select the columns that you want to be expanded, and then click OK.
After the selected columns are available in the Query Editor, click Apply & Close to import the data to the Excel sheet.